There were so many amazing little stories that made our time with Josephine just more amazing than we realized. I wanted to share them with you! As I posted in Josephine’s birth story, Mum was flying over when we had to leave for the hospital. She didn’t know anything that was happening at all. After her layover in Los Angeles, she boarded her Delta flight to New York. She was relaxed because Delta have inflight WiFi so she knew we would be able to be in touch on that flight. When she attempted to connect in flight, it would not work at all. She asked a Flight Attendant for assistance, to which she got none at all and the Attendant curtly told her to refer to the card in the seat pocket. That card was no use at all and mum was frustrated and upset, knowing she couldn’t contact us. She pulled out her word find book mid-flight and started a word find puzzle which just happened to be about girls names. At one point, one of the clues was ‘Josephine’ (I kid you not!) Mum circled the word and wrote the time that this happened. With that, she did a thing that is so unlike mum! She got up, and walked down the back of the plane where the flight attendants were sitting down and chatting away. Mum got the courage to explain to her why connecting to the WiFi was so important. She said “I wouldn’t have asked you for help with the WiFi unless I really needed it…” and she explained in a strong voice what was going on. She then asked the Attendant “I know you can’t fix the WiFi but is there some way, any way you can get me off this plane first so I can get straight to the hospital?” The flight attendant said “Leave it to me” and mum returned to her seat. The weekend before Josephine was born was when I was very unwell. Bill had a Parish Council meeting at Queen of All Saints. I always normally bake something for him to go with. For that meeting, I made him mum’s Cornflake Cookies. They were a big hit! One of the Parish Council members had just found out we were expecting a baby and proceeded to congratulate Bill and Bill gave him some cookies to take home. It was afterwards that Bill explained to him what was going on and that Josephine would most probably not be with us long. This was the terrible news we were so used to giving, but we understood that for people first hearing it, it could be a shock. Mum said how I did go to Queen of All Saints. The flight attendant said “Jenelle baked us cookies last week!” to which mum said “Yes! They are my cornflake cookies!” The flight attendant was the wife of the Parish Council member Bill was talking to. Yes, seriously! Just to add to it – I had never met either of them! With that, mum was looked after as she deserved to be. The flight attendant said she would drive mum to our apartment to get home, but mum was not able to do that as we had a car service meeting her at the baggage claim. Never mind, when the plane landed mum was indeed off the plane first and Delta had arranged for a cart to be at the gate to whisk her straight off to the baggage claim. We still cannot believe what happened during that flight. From the word find, to the WiFi not working to then having someone on the flight who knew about Joey. She sure was looking after her nana. Over a weekend at Queen of All Saints we had a 24 hour Adoration. Bill and I took the 7am shift. We always take some kind of prayer books with us and one was a book of Saints. The morning sun was shining through the windows. We were sitting in the silence in the presence of the Blessed Sacrament when I opened up a random page. 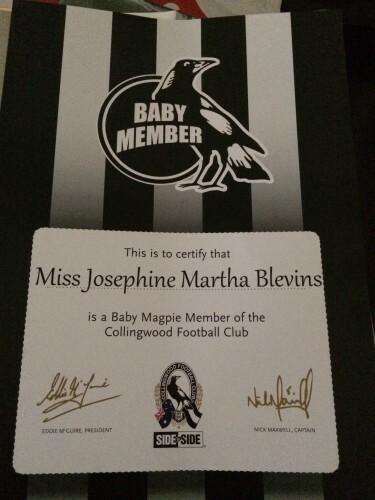 It was for February 9 – Josephine’s due date was February 8 or 9! The feast day? A Saint called St. Josephine Bakhita. We had never heard of her before. I started crying – her story is an amazing one of strength and faith. Over the next few weeks, I read more and more about her. One Sunday at Mass, I was looking at the tapestries above the altar, like I have every weekend for years. I couldn’t believe it. One of the Saints on the tapestry was St Josephine Bakhita. She was actually included when she was Blessed! We had no idea of St Josephine when we chose Josephine’s name. We took it as the feminine Joseph. But this just made it all the more amazing! We set about the pregnancy focussed on the February due date. Of course, Josephine had other ideas. When I went into labor, we received a Facebook message from our friend, Isabel that her family in Mexico was praying for all of us and how wonderful it would be that Josephine would be born on the feast day of Our Lady of Guadalupe. We were excited as she is the Patron Saint of the Americas so we knew our little yankee Josephine would be getting looked after in a grand fashion but my jaw dropped when I was laying there, reading about the other patronages – she is the Patroness of the Unborn Child and the Pro-Life movement. Could there be any more perfect of a day for Josephine to be born? She made us work. Hard. When mum arrived at the hospital, she had bought some lovely lavender oil that Matthew and Leah sent over with her. We used it on Josephine after we gave her a nice bath. Lavender just ended up becoming the smell we most remember Josephine by. All of her things that we bought home smelt of the gentlest lavender fragrance and it was just perfect for her. We really didn’t tell anyone about this. Then, my friend Kat sent me a little care package for Christmas. In it? A small vial of lavender oil. We ended up buying some French lavender to sprinkle at her gravesite every time we visit. Then, I was doing some reading and found out that it was supposedly one of the Virgin Mary’s most loved plants. See a theme? In ancient times, Lavender was seen to represent purity, cleanliness and virtue. As a surprise for me, Bill contacted Collingwood and explained our situation with Josephine and the he wanted her to be a Collingwood member. They issued a baby membership certificate for her and sent it all the way over to New York! 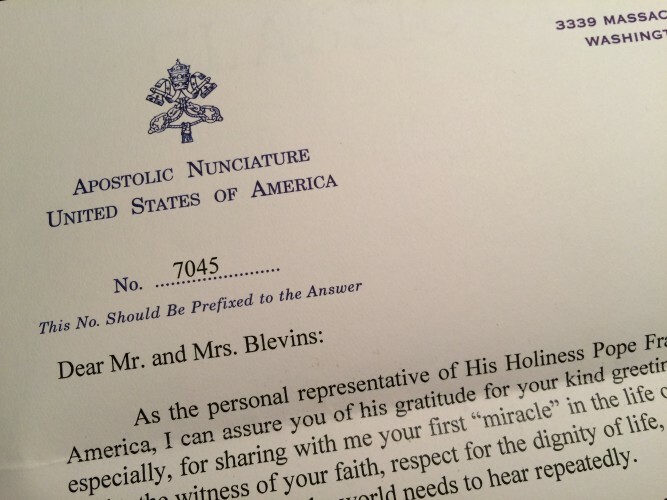 After Josephine’s birth, Bill sent a letter and one of Josephine’s Mass Cards to Pope Francis, Pope Emeritus Benedict XVI, Archbishop Carlo Maria Viganò the Papal Nuncio to the United States, Cardinal Dolan and Bishop DiMarzio telling each of them about the support we received from the Gianna Center and our own Father Joe. He thought it was important that they knew about Josephine and how our faith and those involved in it, helped us along the way. Sometime after that, Father Joe called us to say that Bishop DiMarzio had contacted him and wanted to assist us with getting special Papal Audience seats for our upcoming trip to Rome. We felt so blessed! Then one day, we came home to a letter from the Papal Nuncio on behalf of Pope Francis, giving his ongoing support and prayers to us! As an aside, when we had to collect our Papal Audience tickets at the Pontifical North American College in Rome, the staff and Sisters there had all heard Josephine’s story and were so excited for us that we were pregnant again! Through the pregnancy, our whole focus was “Let’s get through Thanksgiving and then we can just enjoy the December and January together while waiting for Josephine”. Everything had been crazy up until Thanksgiving. Driving back from Albany on the Sunday evening, I was really starting to feel sick (and obviously I did not understand what was happening at the time) but I remember saying to Bill “Now – we can just enjoy December – even though you will be in your busiest time at work, we can just take it easy and get everything back on track. Little did we know that the exact time I was saying and thinking that, it happened to be the last day I was pain free for many weeks. It was during this time that I learnt very quickly how very much out of our control so much in the world is. Thank you Josephine for waiting until after Thanksgiving for wanting to meet us! When Dr Smok visited us the morning of Josephine’s birth, we excitedly told her about it being the Feast Day of Our Lady of Guadalupe. She then mentioned that her dad had been taught by Pope John Paul. Wow! To us, these were all little shining stars of support to get us through what was happening to us.